LeBron James, leader of the Cavs. For the 14th time, we’ll get an NBA Finals rematch, this one between the Golden State Warriors and Cleveland Cavaliers. Last year, the Warriors overcame a few early-series hiccups to close out LeBron James and the otherwise-undermanned Cavs in six games, beating them by an average of 7.2 points per game in the series. But James thinks things will be different this time around. He’s right that this version of the Cavs is far better than the iteration Cleveland sent to the finals last season. Missing Kevin Love and Kyrie Irving for much of the postseason a year ago — Love was lost for the playoffs in the first round, and Irving logged only one appearance in the finals — the Cavs provided James with one of the worst supporting casts ever dragged to the cusp of a championship. That Cleveland at one point managed to claim a 2-1 series lead against Golden State was mostly a testament to the singular greatness of James, who produced one of the best individual performances in finals history despite losing. 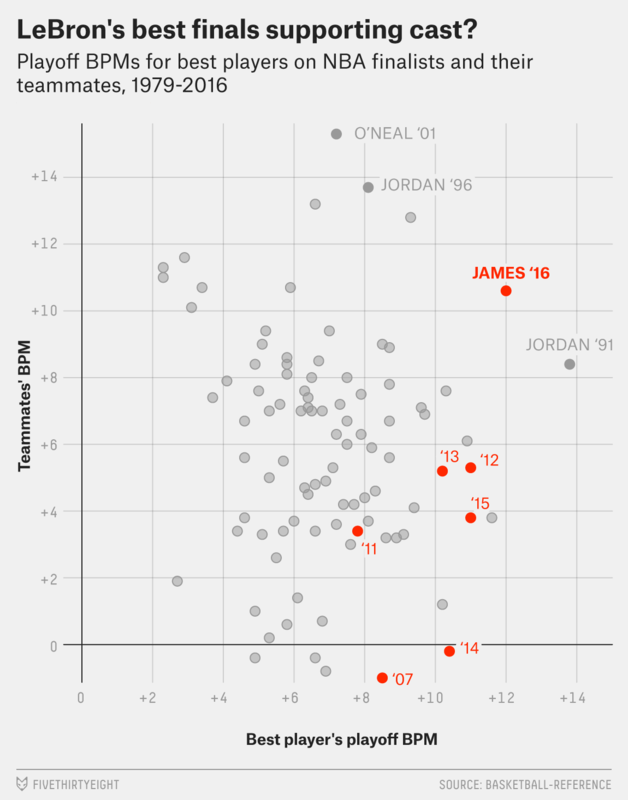 The Cavaliers who suit up alongside James this year will be far better. 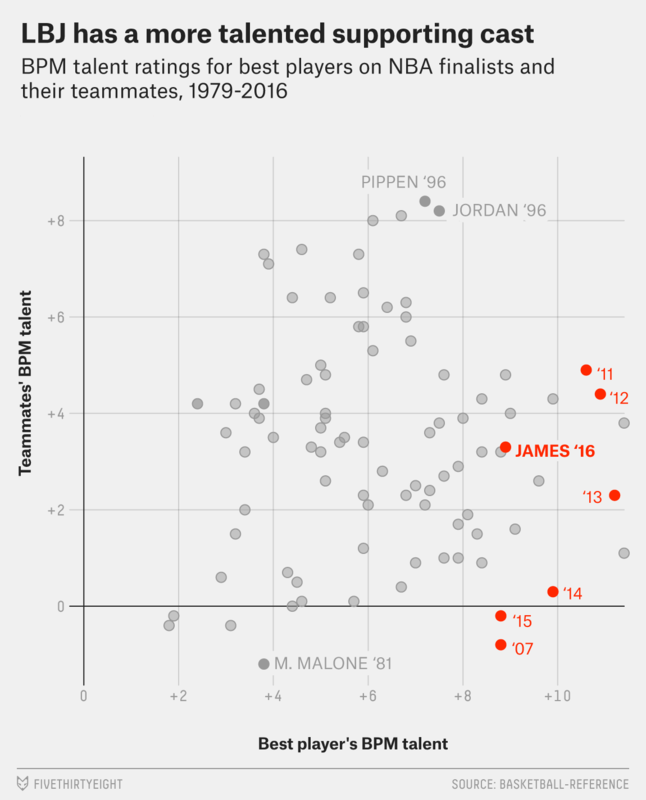 To measure the quality of James’ supporting cast (and those of every player who led his team to the NBA Finals since 19791), I first calculated a multi-year Box Plus/Minus (BPM) talent projection for every player on a finalist’s playoff roster, tracking the number for the team’s best player2 as well as his teammates. (Defining the quality of a player’s teammates as his team’s BPM if that player was replaced with a league-average, zero-BPM talent.) While James’ supporting cast last year ended up ranking 88th out of 93 entrants since 1979 — sixth from the bottom of the list — this year’s version ranks a far more respectable 50th in terms of raw talent. But it also bears mentioning that Cleveland has been playing well above its established talent level during the playoffs thus far. Their offense has been an order of magnitude better than it was during the regular season, and although some of that has come from simply shooting the lights out (their effective field goal percentage has been a league-best 5.1 percentage points above what we’d expect from the quality of their shots during the playoffs), they’re also assisting on a higher percentage of their made buckets in the playoffs — perhaps a sign of the greater cohesion James alluded to. Furthermore, James himself is also enjoying one of his best-ever playoff performances this season. That’s why, according to playoff BPM, the Cavs as a whole rank fourth among all NBA Finalists since 1979. If we focus on recent play, Cleveland certainly looks “better built” this time around. But a team’s long-term track record should count for something as well, and by that standard the Warriors still have the edge. Golden State went into last year’s finals with an Elo rating (our pet metric for gauging team strength) 90 points ahead of Cleveland — the equivalent of 3.2 points per game on the scoreboard at a neutral court — and they currently lead the Cavs by 64 — about 2.3 points per game — despite Cleveland’s playoff surge. Slicing the favorite’s edge by nearly a point per game isn’t nothing, but the Warriors also have home-court advantage again, to say nothing of the benefits they might reap from their championship experience of a year ago. So even the better-built version of the Cavs comes into the finals as an underdog. But with superior teammates this time around, James will have a far better opportunity than last year to change his underwhelming lifetime finals record for the positive. The rest will be up to him. Check out our latest NBA Finals predictions. The earliest season for which data availability makes this exercise possible. I was liberal in my definition of a team’s “best player” — if a player either had the highest talent rating on his team’s postseason roster, or led the team in playoff value over replacement player, I included him in the sample.